I bought brand new ink cartridges (of every color) for my Epson Stylus Photo RX-510 last week. I needed to print out a document that only needed black ink, but the stupid printer refused to work unless all the color ink cartridges had ink in them. What a scam. So I hauled myself to Sim Lim and bought 90 SGD worth of ink cartridges. Today I fired up the printer because I needed to print 2 pages of a document. In black. IT DIDN’T WORK. I spent hours troubleshooting it and finally gave up. It was dead. Time to get a new printer. Have you ever gone to Sim Lim while suffering from a cold? It’s not enjoyable at all. Trudging from store to store, asking about prices, trying to bargain, batting away all the flyers people are shoving at you… bah! 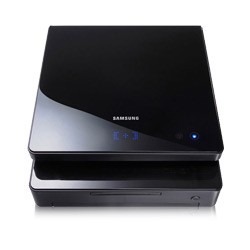 I bought the Samsung ML-1630W on the recommendation of a friend. It’s a monochrome laser printer. Reviews of it on Amazon indicate that people have trouble setting it up on the network. I did as well. I resorted to calling Samsung technical support who, while extremely friendly, were horribly wrong in their assessment. They told me the printer was broken and that I should return it to the store. So I rolled up my sleeves and figured out how to do it myself. My network configuration – wireless router with WPA-Personal security, some laptops connected wirelessly and a desktop connected via wire. Hit Apply – this will force the printer to always have these IP settings – you need to do this cause the printer is too stupid to work with the Dynamic IPs assigned by the router’s DHCP server… even though it’s supposed to!!! Pump your fist in the air and yell, “Take that Samsung! Screw your technical support! I am a computer god!” And then realize you spent hours fussing over this and feel hateful towards all big companies and their inability to provide adequate technical support. 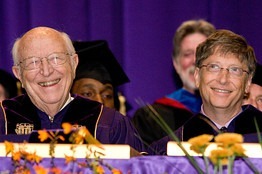 People should envy Bill Gates not for his wealth but for the relationship he has built with his parents. 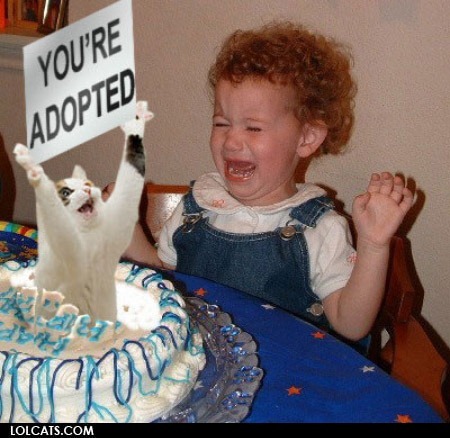 Visiting lolcats.com always brightens my day. The internet has been rife with speculation about whether the Project Natal demonstration at E3 was rigged. Kudo Tsunoda, creative director for Project Natal, made an appearance on Late Night with Jimmy Fallon and dispelled those rumors. Natal is going to be awesome! Normally I’m not one to share inspirational / how-to-be-successful articles (I find most of them cheesy), but I like Mark Cuban’s plain-talking straightforward views. 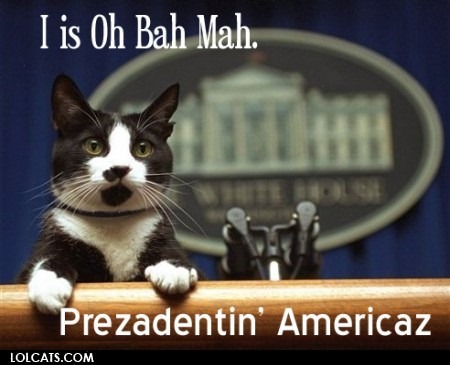 I also admire how he was pretty much just like any of us. A struggling student, didn’t get the best of grades, and goofed off with his friends most of the time. “1. Recognize that its ok to live like a student. I’ve installed the Windows 7 Release Candidate on all my machines. It’s running on a custom-built Intel Core 2 Duo desktop, a HP Mini 1000 Netbook, and a 15 inch Macbook Pro running Boot Camp. They are all running very well. The only “problem” is I can’t get the microphone in the HP Mini 1000 to work but I haven’t spent time trying to fix that yet. The other machines are running great and the only times I have needed to reboot have been when Windows Update sent some test patches through the system. Best of all, sleep mode finally WORKS! On my Macbook Pro it was > 70% chance that if I closed the lid or otherwise put the machine to sleep, it would hang and need to be powered off without the proper shutdown procedure. Now I snap the lid shut and it goes to sleep like a little baby that has drunk Nyquil. Anyway, a great personalization feature of Windows 7 is themes. There are some included by default that are beautiful. Architecture, Characters, and Scenes are the ones I like the most. 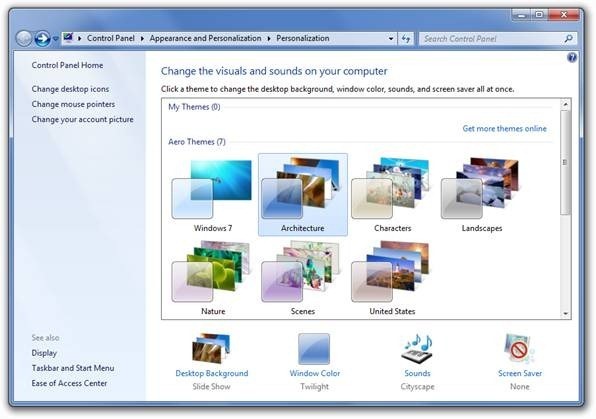 This entry from the “Engineering Windows 7 Blog” explains how to create, save, and share Windows 7 themes.